Villa Marbella is a combination of Pacific coast contemporary with an infusion of Mexican design and organic details. Located hillside in Upper Conchas Chinas, only a 5 minute walk to a fabulous sandy beach. With breathtaking ocean views from all rooms and spacious terraces for lots of outdoor living. 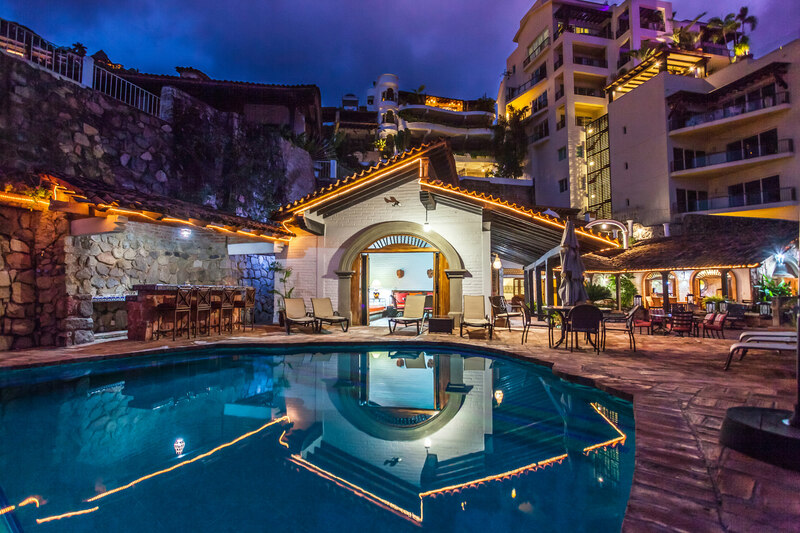 Including a full staff all within 2 miles of downtown Puerto Vallarta with gourmet restaurants, nightlife and shopping. The 5 level villa is designed to provide the maximum in indoor and outdoor living. Enter into a walled courtyard and pass through immense antique wooden doors to the main level with kitchen, dining living areas terrace and pool. The Villa has a total of 8 bedrooms, with the option to rent as 6, 7 or 8 bedrooms. All rooms have ocean views and open onto the common terrace. The lowest level is a game room with pool table, games, books and a large screen TV and DVD player for watching movies.